Aircraft wing is referred to a type of wing that produce lifts. Wings have streamlined cross sections that are subjected to aerodynamic forces. Wings are the basic component of an aircraft to fly. The shape and design of aircraft wings play an important role in defining aircraft operations. The shape and design is required to generate the proper lift and streamline flow while reducing the drag and weight acting on the aircraft. The global commercial aircraft wing market is expected to grow at a CAGR of 7.2% over the forecast period i.e. 2017-2024. Further, the factors propelling the growth of commercial aircraft wing market includes growing demand for improved aircraft stability wing flight control surfaces and robust expansion of aircraft industry. On the basis of aircraft type, the global commercial aircraft wing market is segmented into narrow body, wide body and regional jet. Further, narrow body dominates the overall market in 2016 and is believed to continue its dominance over the forecast period. Moreover, narrow body segment is projected to post the CAGR of 7.1% by the end of 2024. In terms of regional platform, Asia-Pacific region is anticipated to be the biggest market of commercial aircraft wing by the end of 2024. Moreover, the factors propelling the growth of commercial aircraft wing market in Asia-Pacific region includes growing demand for energy efficient planes. Likely, China and Japan are the major countries contributing in the market of commercial aircraft wing due to increasing air travelers. Furthermore, Asia-Pacific region is believed to be the most lucrative market owing to emerging economies such as China and India. North America accounted the second largest market of commercial aircraft wing in terms of revenue in 2016 aided by U.S. Further, this growth of commercial aircraft wing is attributed to the increasing commercial aircraft industry in North America region. 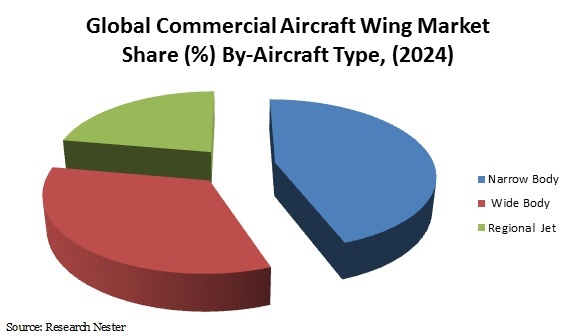 Moreover presence of major key vendors of commercial aircraft wing in this region is expected to bolster the growth of commercial aircraft wing market. Factor such as growing advancement in the technology of aircraft wings and robust expansion of aviation sector are believed to be the dynamic factor behind the rapid growth of commercial aircraft wing market across the globe. Moreover, rising tourism around the globe along with rising demand for better commercial aircraft are envisioned to flourish the growth of commercial aircraft wing market by the end of 2024. Furthermore, growing research and development activities by major players in the field of aircraft wing owing to growing demand for light wings and evolution of aircraft industry are projected to foster the growth of commercial aircraft wing market. Likely, rapid urbanization coupled with rising GDP figures of developed and developing regions is expected to propel the growth of commercial aircraft wing market. In addition to this, demand for innovative design to improve the aircraft efficiency is predicted to bolster the growth of commercial aircraft wing market. However, volatility in the price of raw material is expected to hinder the growth of commercial aircraft wing market over the forecast period.